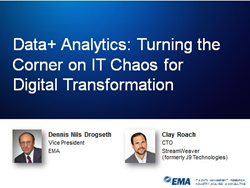 Enterprise Management Associates (EMA), a leading IT and data management research and consulting firm, today announced it will host a webinar titled “Data + Analytics: Turning the Corner on IT Chaos for Digital Transformation,” featuring Dennis Drogseth, vice president of research at EMA, and Clay Roach, chief technology officer at StreamWeaver. IT operations, as well as IT in general, are often fragmented in the face of cloud, agile, and mobile, along with other pressures to adapt and perform as a true business. As a result, digital transformation remains more of a promise than a reality for most organizations. Fortunately, there are signs of progress—most notably a growing array of capabilities for cross-domain, advanced, predictive analytics for optimizing IT service delivery and minimizing disruptive incidents. Getting relevant data across multiple sources and silos to enable advanced IT analytics, however, often remains the number one challenge.